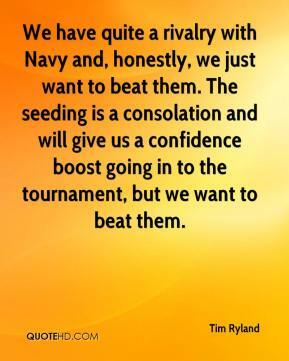 We have quite a rivalry with Navy and, honestly, we just want to beat them. The seeding is a consolation and will give us a confidence boost going in to the tournament, but we want to beat them. Honestly, it wasn't (too tense). 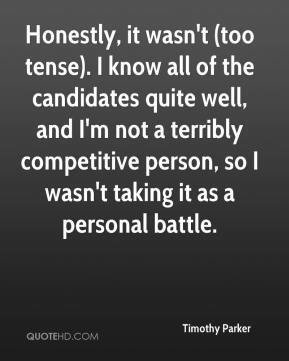 I know all of the candidates quite well, and I'm not a terribly competitive person, so I wasn't taking it as a personal battle. 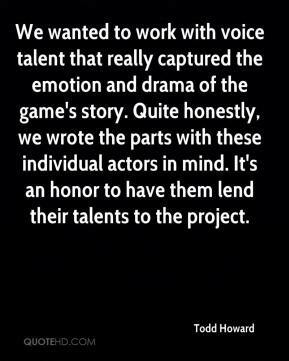 We wanted to work with voice talent that really captured the emotion and drama of the game's story. Quite honestly, we wrote the parts with these individual actors in mind. It's an honor to have them lend their talents to the project. 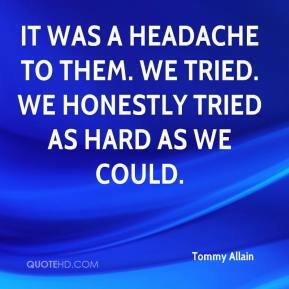 It was a headache to them. We tried. We honestly tried as hard as we could. I watched one installment and really, honestly, have nothing but sympathy for the guy. He's got so much on his plate right now. It's largely of his doing, but still. 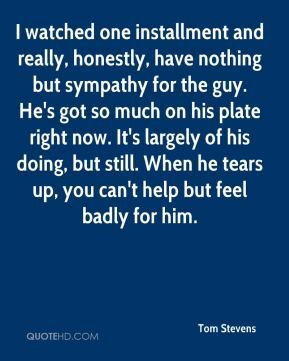 When he tears up, you can't help but feel badly for him. Honestly, it feels much more diluted than Salt Lake. 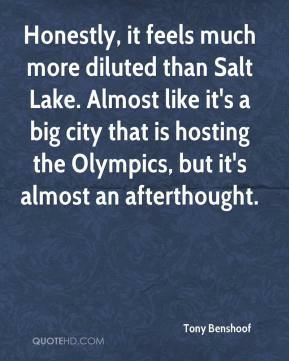 Almost like it's a big city that is hosting the Olympics, but it's almost an afterthought. I honestly can't tell you the last time I went to see a doctor. 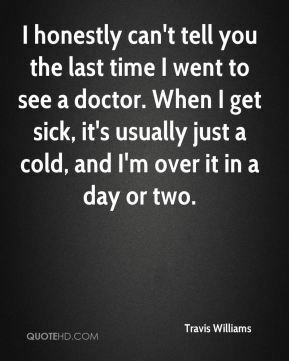 When I get sick, it's usually just a cold, and I'm over it in a day or two. Honestly, most people in baseball would tell you that he went into a bad situation. 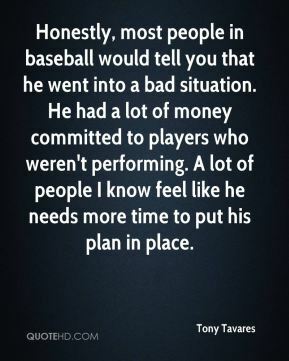 He had a lot of money committed to players who weren't performing. 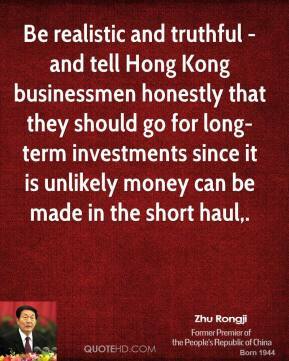 A lot of people I know feel like he needs more time to put his plan in place. 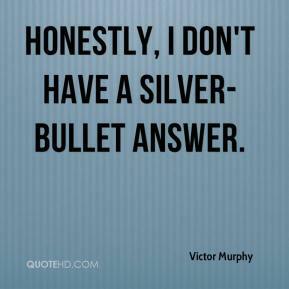 Honestly, I don't have a silver-bullet answer. None of us can honestly grasp the level of tragedy, but on an individual basis, we deal with refugees on a daily basis, ... 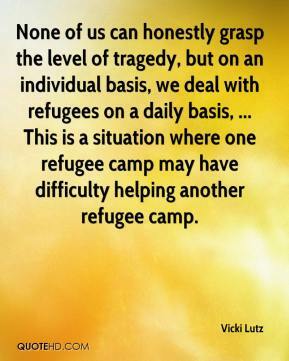 This is a situation where one refugee camp may have difficulty helping another refugee camp. Today you saw the evidence that if Ukrainian privatization had occurred honestly, we could have received big financial opportunities to solve all kinds of concerns, including social concerns. You get more used to it. Honestly, I like playing on the road. I like coming into somebody else's house and playing against them. 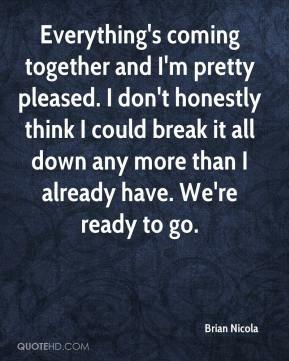 It's a big challenge for us, and we all love the challenge. 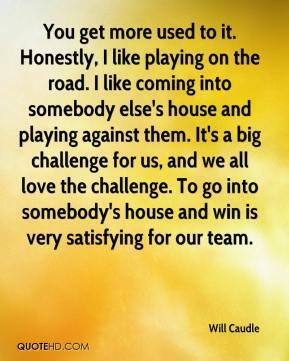 To go into somebody's house and win is very satisfying for our team. I'm more serious about the job. I think Jack needs to mature a little more, honestly. Hopefully, they can say, "There goes the best baseball player in the world." 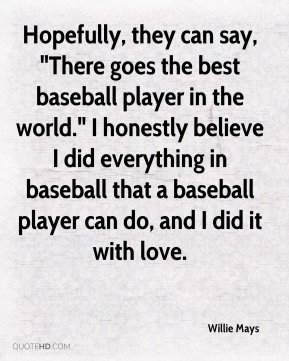 I honestly believe I did everything in baseball that a baseball player can do, and I did it with love. Honestly, I felt incredibly welcome -- I thought that the whole area in the range opened up to us. I'm sure to some degree there were some people that weren't accepting of us, but at least they weren't showing it. 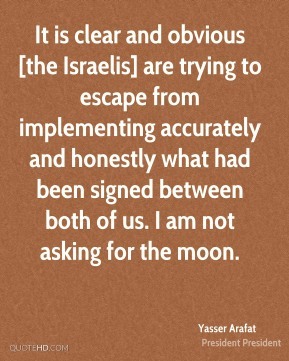 It is clear and obvious [the Israelis] are trying to escape from implementing accurately and honestly what had been signed between both of us. I am not asking for the moon. 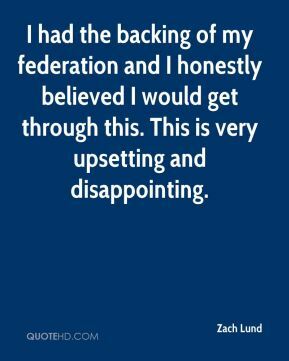 I had the backing of my federation and I honestly believed I would get through this. This is very upsetting and disappointing. Honestly this is an important experiment for us. We're going to find out here in these next exciting years whether this can be a hockey town. 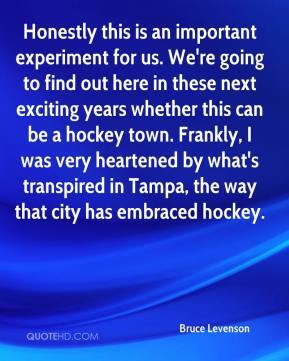 Frankly, I was very heartened by what's transpired in Tampa, the way that city has embraced hockey. He's honestly the best person I think I know. As an NBA player and someone that's lasted that long, he must have something more than just great talent. You have to have a good spirit and uplift the kids. It's been a wonderful friendship with him and his family now. It's going to be wonderful to see him more now since he's moving back here. It's been a wonderful experience. 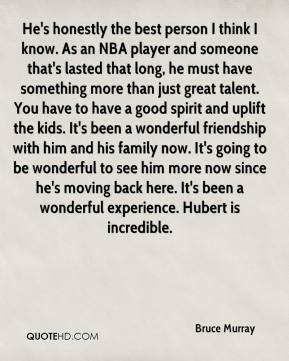 Hubert is incredible. Everything's coming together and I'm pretty pleased. I don't honestly think I could break it all down any more than I already have. We're ready to go. Honestly, I didn't know what to expect at Arizona. 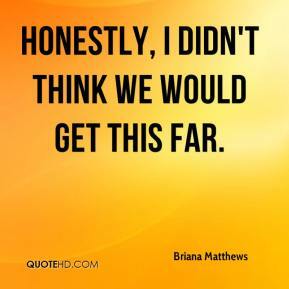 But I liked our effort. 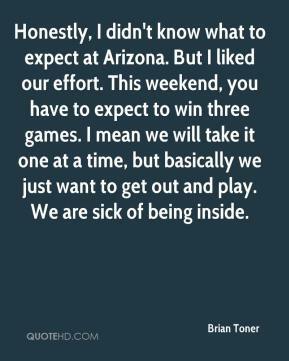 This weekend, you have to expect to win three games. 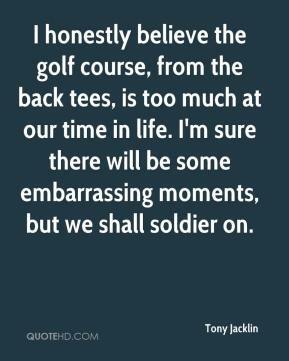 I mean we will take it one at a time, but basically we just want to get out and play. We are sick of being inside. I honestly don't know. I think it hit my arm or something, maybe. I shielded my face because it was coming at my face. 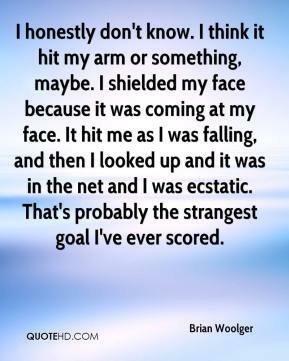 It hit me as I was falling, and then I looked up and it was in the net and I was ecstatic. That's probably the strangest goal I've ever scored. Honestly, I didn't think we would get this far.